Oracle Racing’s AC45 catamarans, blasting up and down San Francisco Bay, have inspired a torrent of breathless prose. But are they fast? Really? AC45 #4, skippered by Jimmy Spithill, and #5, skippered by Russell Coutts, have generally used the Golden Gate Bridge as a windward boundary for their race training, which places their turning point right off Crissy Field, one of the world’s great sites for windsurfing and kiting. And the kite guys, especially, have been keen to take on the cats. After all, the 500-meter speed sailing record presently belongs to American Rob Douglas at 55.65 knots. With a kite. You got to go sailing on one of the cats. I’ve been close, though. On two days we lined up with them on kites. Pretty amazing. The first day, they were racing, so I didn’t want to get too close, but I jumped in on a downwind leg and paced them for a while. Later, Joey Pasquali (who will be joining John Craig ((AC34 PRO)) as a mark-set boat driver), Bryan Lake and I followed them around for an hour or so on our courseboards. I would say that on upwind angles we were even, but they had a tiny speed advantage with that not-slowing-down-over-chop thing they’ve got going. We get bounced on our 6-foot boards. Their leeward hulls just drive through it. But it was pretty amazing to sail half a boatlength away from one of those things, just to leeward, off their bow, and hang with them. Downwind we were close, but I can’t honestly say I was faster. Once again, their advantage…hmm…doubling their sail area downwind. If only I could magically turn my 9-meter kite into a 15-meter kite when I round the top mark. It is a fact that the top kite sailors can hang close to the AC45s. It is also a fact that most of the sailing world has yet to absorb just how cool kites are. 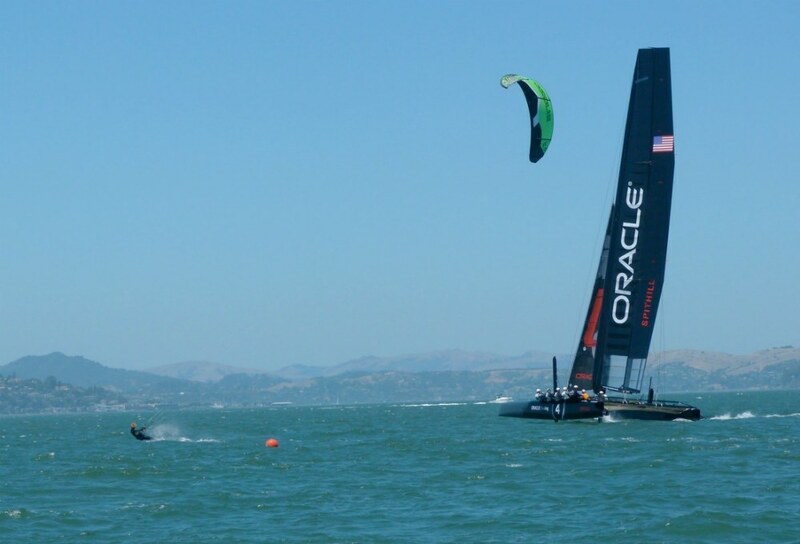 But there is another dimension to this story, On February 14, 2010, Oracle Racing’s giant trimaran, skippered by Jimmy Spithill, won race two of AC33 and with that, won the America’s Cup for the sixth trustee of the cup, the Golden Gate Yacht Club. Last week, the club next door—the epicenter of the development of kite course racing—was running the Opti Heavy Weather Clinic and Regatta. Out of that, thanks to the BAMA forum (Bay Area Multihull Association) and Chris Harvey, I am able to share with you the true master of speed on San Francisco Bay. Fair warning. For those of you (us) who bought into the whole AC-boats-are-awesome, wingsailed-catamarans-are-fast thing, this link could be shocking. The Real Club Nautico de Valencia (RCNV) and Green Comm Racing announced the details of their Challenge for the 34th America’s Cup at a press conference this afternoon in Valencia, Spain. The Green Comm Racing team, representing Spain’s RCNV, completes the field of nine teams from eight nations that will be on the starting line in 10 AC 45 catamarans at the first America’s Cup World Series event in August in Cascais, Portugal, the first competition in the lead-up to the 34th America’s Cup. The team’s objective is to promote and manage the “Green Revolution” by leveraging the media impact of international sport’s oldest trophy. The aim is to give visibility to the challenge of sustainability on a global scale by promoting the development of new technologies and new endeavors in the field of Green Tech. The team, led by Francesco De Leo (former Manager Director of Telecom Italia, former Director and Head of Strategy and International Operations of Wind and 1999 Global Leaders for Tomorrow at the World Economic Forum), includes Marco Nannini – CEO (former Management Consultant to The Boston Consulting Group and Roland Berger) and Luca Devoti – Sport Team Manager (Silver Olympic Finn sailing and a successful sailing entrepreneur). The athletes who are part of the team are young and have an impressive track record in Olympic classes. The new America’s Cup will be raced in faster boats which will be physically more demanding than ever: a young team will be positioned to provide a competitive advantage. the training sessions ahead of the first AC race in Cascais (Portugal). The RCNV will not only be the Green Comm Racing team’s operational base but it will be the global hub for selecting the next generation of talent through a number of trials which will be open to the best young sailors in Spain and across the world. To address the challenge of designing the AC72, Green Comm Racing has engaged two leading universities, University of Pisa and UCLA, both world class institutions working in the field of Computational Fluid Dynamics and Sensory Wireless Networks. As a starting point for the development of the AC72, the team will take advantage of the existing design package prepared by ACRM. Green Comm Racing has a long term vision focused on sustainability. Interbrand, Sim2, Prodea Systems and Expo 2015 are among partners that have joined RCNV and Green Comm. Racing for the launch of the challenge for the 34th America’s Cup; more partners will be announced in the coming weeks.